My older sister, Alexis, is getting married this fall in Charlottesville, VA (a place I know very little about - other than UVA is its heart and soul). Recently, my sisters, mom and I took the (short) three hour drive from DC to Charlottesville so we could see her wedding venue and do some planning. It is absolutely adorable, and I can't wait for her big day in October! On our trip we wandered and explored the whole little town: we were sure to research the best wineries ;), places to eat, and best shopping so we can make recommendations to wedding guests (if you have any suggestions, please send them our way!). While strolling the mall we stumbled upon a hat vendor where my mom and I spent a good 45 minutes trying on Pokemon and Porky Pig hats while the poor kiosk owner was trying to close his shop. 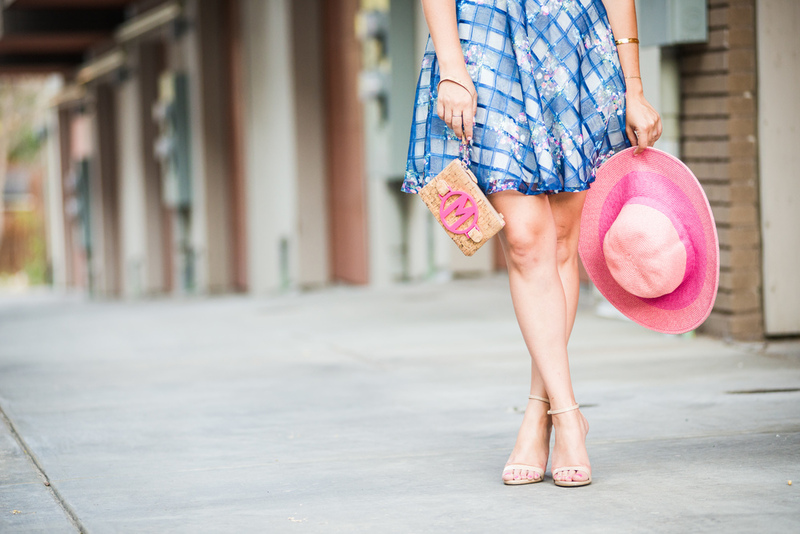 I finally settled on this perfect pink sun hat (similar here, here, and here) which has become my go-to and is really the Goldilocks of hats… not too big, or too small, too expensive, just right (and pink - even better)! I feel the same way about this dress. It has been great for weddings, so fun for dancing and twirling, and could also be dressed down with flats and a sun hat for brunch with the girls. I was slightly skeptical when I first visited E-Shakti because the clothes look a little more relaxed/mature than I would normally wear, but after clicking on skirts, and dresses (surprise, surprise), I realized that this site has a great selection of girly pieces that fit my style (specifically in the organza/tulle family). I was really impressed when ordering my dress. As a petite person, I really liked that you could customize length and everything else (ie. neckline, sleeve length, add pockets.... etc.). This dress is sold out, but I also like this one, this one and this one. Eshakti is offering Denver Darling readers a 10% discount through August 4th with the code DenverDarling. I have linked some of my other similar favorites below!